I had never been to the girl’s house and crept down the street squinting at addresses. 37… 34… Close. Close… The numbers were partially obscured but I heard youthful noise so I pulled into the driveway then immediately hit the brakes. 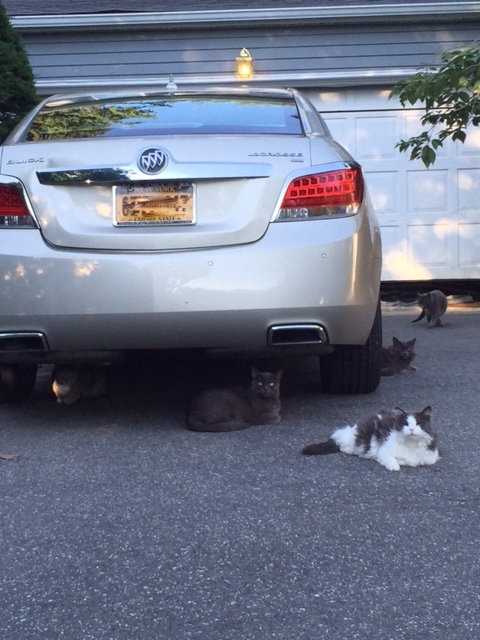 At least 9 cats lounged on the blacktop. Not one of them even flicked a whisker, and after a moment staring me down, resumed the important business of licking themselves and stretching out in the sun. Amused, I zigzagged through them toward the back of the house, but found nothing but manicured grass and empty lounges. The voices were coming from next door. I turned to go back to my car and almost ran right into a pissed off woman. “What were you doing in my yard?” She accused. I received an extremely skeptical look. Jeez. Did people regularly walk into her yard? Did she think I was animal control? I was still giggling when I walked into the next yard and saw my son, his friends and a bunch of girls in shorts and bikinis running around an empty blue pool, circling each other in a fascinating mix of confidence and insecurity. They all stopped their pubescent frolicking at my interruption but only briefly, like I was the most uninteresting person in the world. The boys gave me a cursory smile or wave; my own son the most standoffish among them. I think I heard a cat yawn. “Hey guys,” I said, “I’m picking up you, you and you.” I pointed at three boys who each looked at the guy next to him. A quick huddle ensued and my son was sent over to break the bad news. “But I can take you there. No problem!” I pleaded a little desperately as he led me to my minivan. “Of course you are,” he smiled, pocketing the cash. Then with a hint of boyish bashfulness, he slouch walked back to the yard, behind the fence, to his friends, the bikinis and beyond my reach. With no one to carpool, I drove off rejected and smiling but still feeling somewhat astray. I knew I should have taken the Jeep. What are you looking at? I’m a cool cat too! I am! Fine. Whatever. Posted in Middle School and tagged 7th grade, co-ed parties, cool cats, cool mom, odd mom out, parenting, puberty, walk of shame. Bookmark the permalink.